Cricket and baseball are a lot alike. They employ very different terminology, of course, but basically both sports have bats, batters, pitchers, infielders, outfielders, outs, home runs, and strikeouts. The fans can be kind of similar, too. Sometimes baseball fans are alert and make amazing catches when the ball comes flying into the stands. Sometimes cricket fans are alert and make amazing catches when the ball comes flying into the stands. And, yes, sometimes baseball fans aren’t paying any attention and end up getting hit with the ball, while sometimes…well, you see where this is going, right? Exactly. 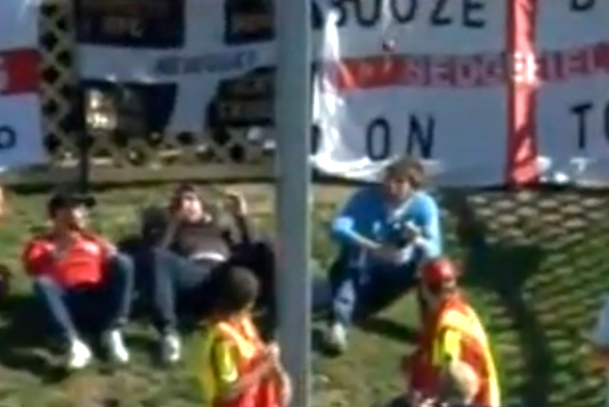 We’ve got a video of a cricket fan getting hit by a ball because he wasn’t paying attention. It happened at a recent test cricket match between England and New Zealand. New Zealand batsman Hamish Rutherford cracked a six—the cricket equivalent of a home run—into the stands, and it hit a guy right on the side of the head. Why? Because just like at a baseball game, the guy was talking to his friends and not paying attention. Surprisingly, the guy doesn’t even leave the game, or go get checked out by medical staff at the stadium! Man, New Zealanders are tough. Hopefully he didn’t die in his sleep from internal hemorrhaging. Although, we probably would have heard about that, right?